“The discontinuity of the associative mode is an aesthetic response to the frenetic, anti-hierarchical experience of postmodernity, an experience in which the human psyche, assaulted by cable news and News Feeds, Twitter and text messages, suffers from a kind of perpetual attention-deficit disorder, leaping about, as these poems do, from one perception to the next.” by Christopher Kempf in vol 64 issue 2 of Shenandoah (direct to essay). Here for the full issue. 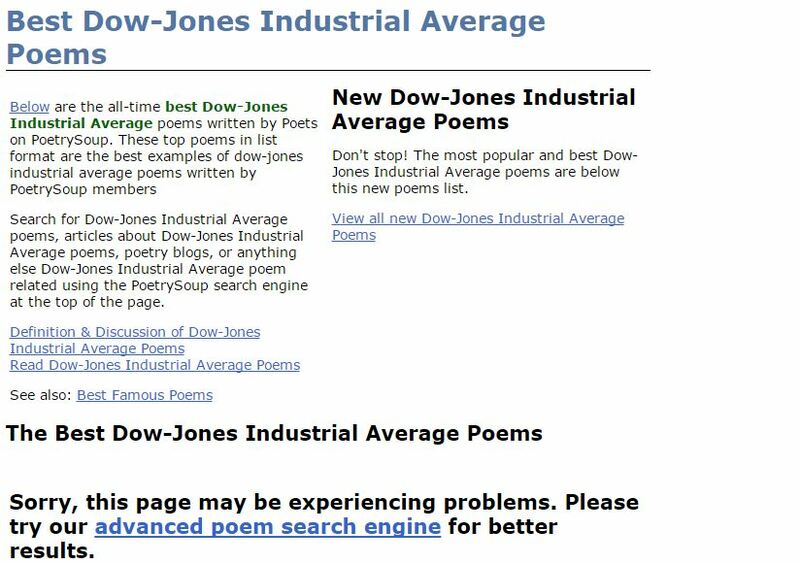 screen shot of what I found when I searched for poems about the Down Jones. Come visit the Superstition Review’s blog to see my guest post here. It deals with the struggle (or not) between mystery and clarity in poetry. Also, see a couple of my poems over at Superstition Review here.